DefTal DJ’s at EyeCandy, Mandalay Bay! Comments Off on DefTal DJ’s at EyeCandy, Mandalay Bay! Looking to get into something cool without breaking the bank? 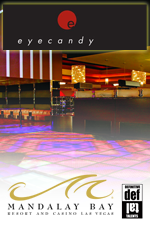 Head on over to EyeCandy in the heart of Mandalay Bay, where DefTal DJ’s play nightly from 9:30pm – 2:30am! Summer is Starting to HEAT UP! DJ Wendicakes is a triple threat! DJ Deniro is Bringing Seattle Flavor to Sin City! DJ Corona – Taking Las Vegas by Storm! © 2012 Definitive Talents, Inc.